The next time you happen to be in Morningside Heights with a few minutes to spare, take a moment to visit the Cathedral of St. John the Divine on Amsterdam Avenue and walk to the building's apse to look at the massive granite columns surrounding the choir. These were originally intended by the cathedral's first architect, Heins & La Farge, to be the largest free-standing columns in the world. 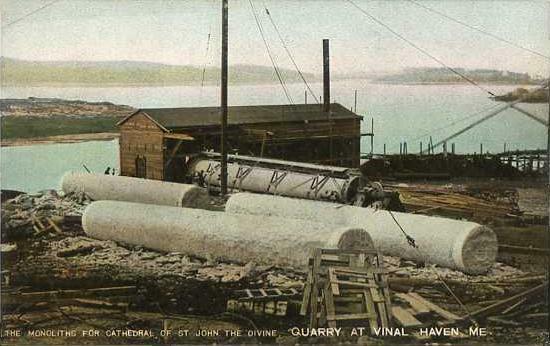 The cornerstone for the cathedral was laid on December 27, 1892—the feast of St. John the Divine—but work proceeded slowly. The sheer size of the project was daunting, and despite the rocky nature of the heights, it took workers a full two years—and 72 feet—before hitting solid bedrock. Once construction began, the architects’ grandiose plans were difficult to execute, in particular Heins and La Farge’s apse, which called for the world’s largest granite columns. A lathe had to be custom-built and only one granite quarry in the nation—in remote Vinalhaven, Maine—was deep enough for the excavations. However, the columns kept breaking under their own massive weight, and ultimately the plan had to be abandoned. You can see one of the columns in two pieces in the postcard at the top. Today, when visiting the cathedral, if you look closely you can see the seams where pieces of stone have been connected together. Heins & La Farge's vision for the cathedral (shown here in the black-and-white image) never came to fruition. In 1907, before even the apse and choir were finished, George Heins died, which freed the cathedral from their contract with the firm. Once the apse was completed in 1911, the cathedral fired La Farge and hired Gothic aficionado Ralph Adams Cram to finish the church. Cram promised he could build the church faster and bigger. He also jettisoned any of Heins and La Farge’s Byzantine touches for a completely Gothic building. Cram’s work began at the crossing in 1916 and over the next twenty-five years his team completed the massive nave. On November 30, 1941, the church kicked off an eight-day festival to celebrate the nave’s completion. On the final day of the festivities, December 7, the Japanese bombed Pearl Harbor and, for all intents, work on the cathedral stopped.